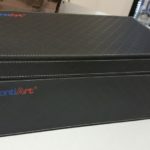 I’m very excited to show everyone the latest and very special addition to my collection! 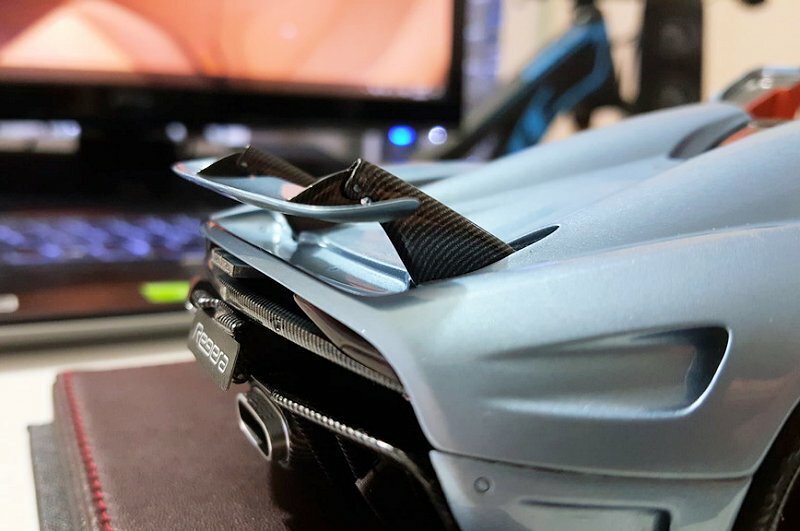 The Fronti-Art 1:18 Koenigsegg Regera in the gorgeous Horizon Blue, and it’s the fully opening parts version! 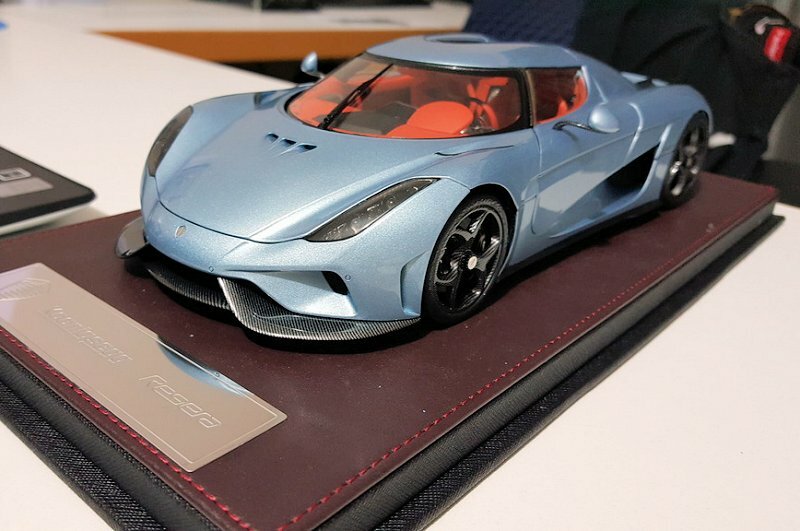 Being a big fan of Koenigsegg, the new Regera in particular and everything else the company does, and when I learned that there would be this version coming I knew I had to have one! 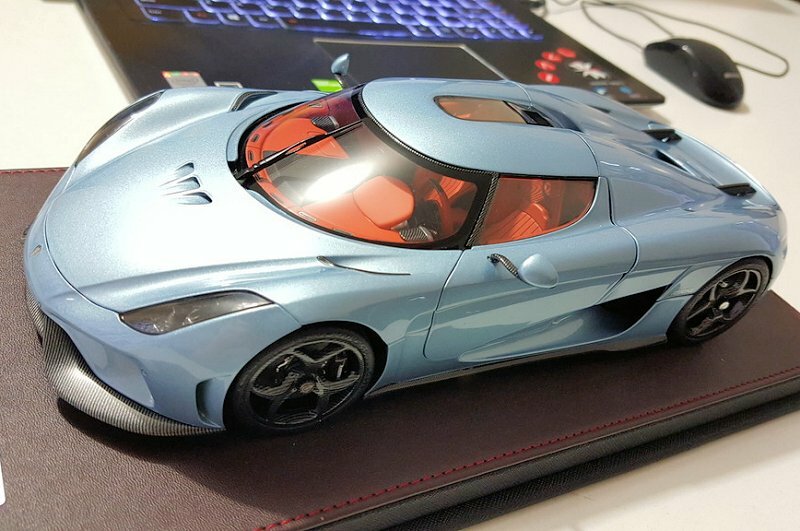 Even though I do like the earlier models before the Regera, I ummed and ahhed about buying a Agera for a while, but after seeing DiecastSociety Team’s review of the sealed body version, I chose to wait for this Regera model as I much prefer the new more flowing and fluid design is ultimately my favorite Koenigsegg model. And now actually owning one (and at a significant expense I might add) I’m more than happy I made the decision to purchase one! And wanted do a review and share with all of you! I’m not going to include any background information on the real car for this review as its quite comprehensive and I would be blabbering on for ages about it all. 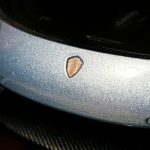 Checkout Koenigsegg.com and Wikipedia page for a wealth of information. 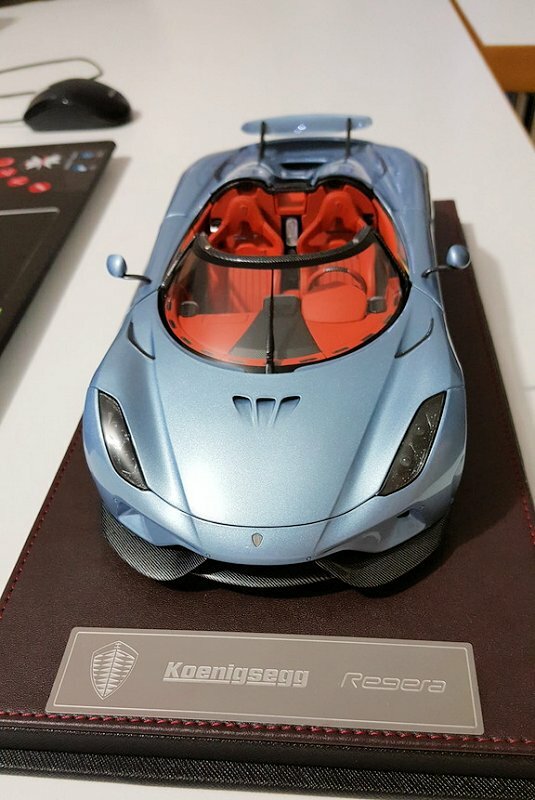 I purchased this directly from Koenigsegg themselves through their online shop. 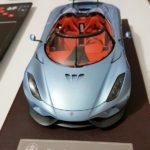 Their asking price of $789 USD included free international DHL postage and the total worked out to about $1100 Australian dollars, which is still a few hundred less than I paid for my former 1:18 Exoto D-type Jaguar which was closer to $1400 delivered! 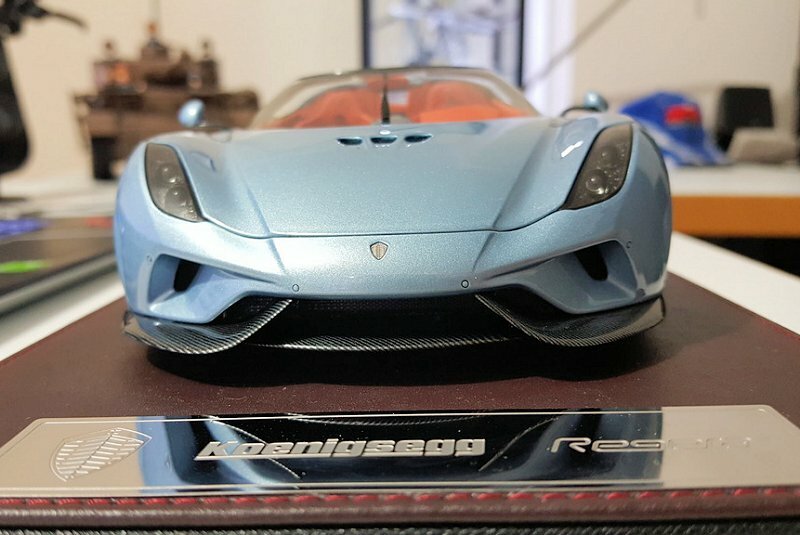 Making the Regera price seem fairly reasonable. I did get stung with import duties and taxes but we won’t get into that as I’d much rather forget it happened. 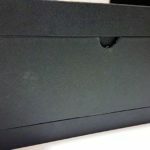 Opening the shipping carton reveals a nicely designed and very display worthy outer box! 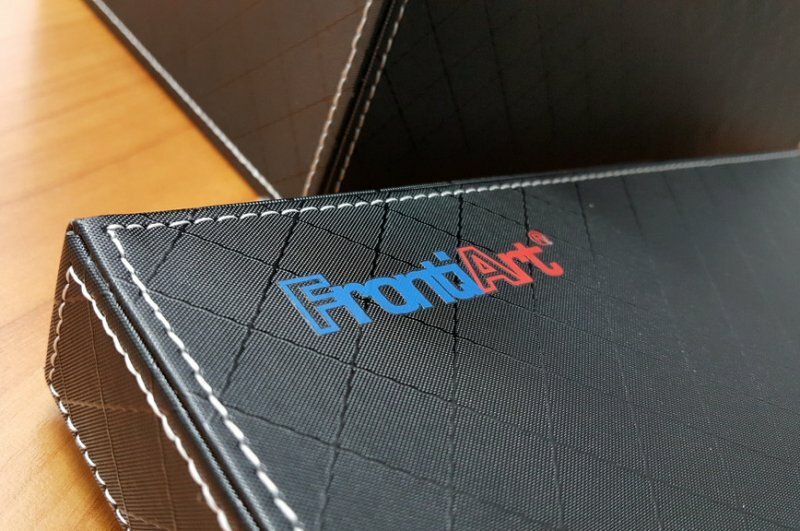 The Fronti-Art logo printed on the sides and lid with white stitching around the edging with a nicely printed criss-cross pattern all over. 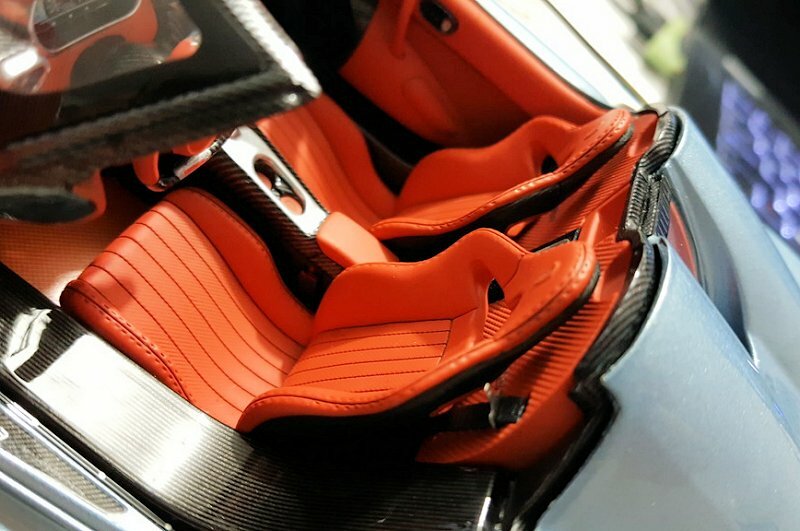 I think its meant to give that leather look but to me it feels like a painted cardboard or other material I’m not sure about. 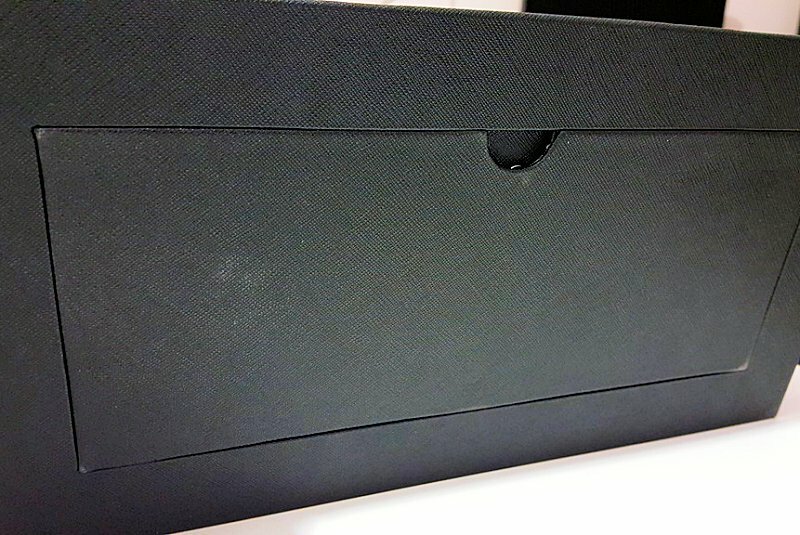 The inner side of the box is lined with a soft touch sponge like material. 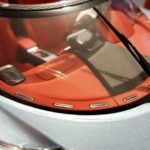 Lifting the lid revels the model screwed down on its included leather wrapped base and clear acrylic display case. Its all wrapped in shrink wrap plastic for protection. 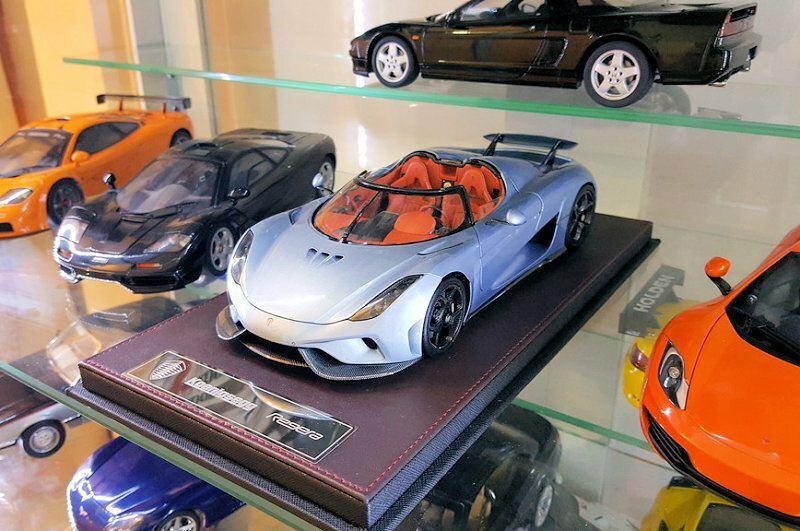 There is also a post card with a pleasant hand written note from Koenigsegg thanking you for your purchase! That’s very sweet of them to do so! Makes you feel appreciated for spending so much money with them! Pealing away the plastic wrapping and removing the clear cover you can see how the model has been carefully secured down to prevent the opening parts from moving around and getting damaged. 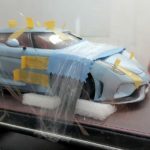 The securing tape strips all came off easily without leaving any marks or sticky residue on the paintwork and did their intended job perfectly. Getting a first time good look at the model it is mighty impressive! Most shut lines are tight but are a little inconsistent in some areas but still much tighter than many or most die-cast models out there, even the premium ones! 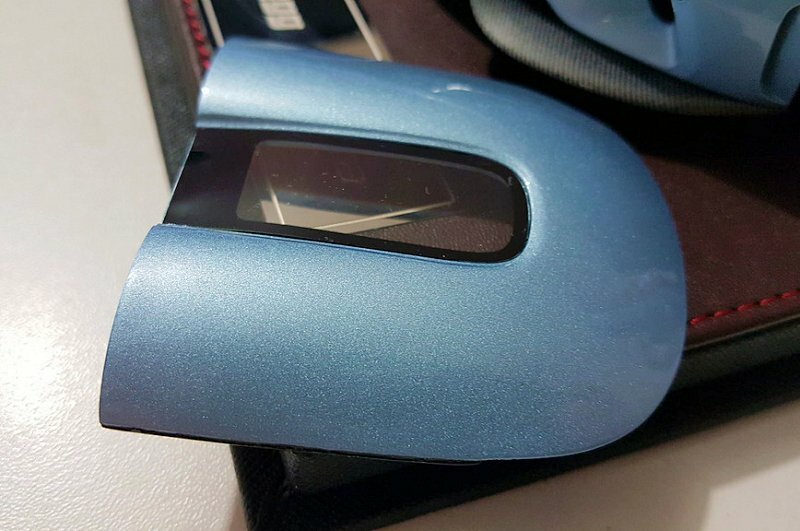 The Horizon Blue paint with its metallic sparkle looks flawless and consistent throughout! I wasn’t able to find any blemishes at all anywhere! 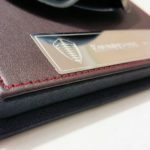 The included leather topped base with stitched edging and an engraved plaque give the impression of high quality and exclusivity. Looks very classy! 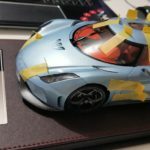 Looking around the model does bring to my attention my first complaint being the carbon fiber weave pattern that doesn’t match the pattern on the actual car. 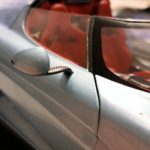 All the visible weave is meant to converge to the center line of the car as shown in this photo of the actual car. 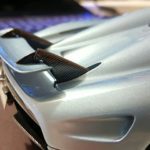 Even though the carbon weave pattern on the model does look very good, this detail error does take the shine off the model somewhat.. 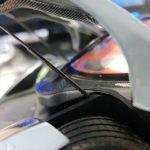 This detail error is also evident in many other areas of the car including the underside of the front and rear panels and the carbon front splitters and certain carbon parts of the passenger cabin. The model can be detached from the base via four screws. 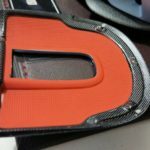 The underside of the base has a removable panel that easily pops off revealing the screws. 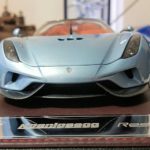 Once removed from its base the model does have a reasonable amount of weight to it especially considering this model is 99% plastic (or “composite” as some manufacturers like to call it). 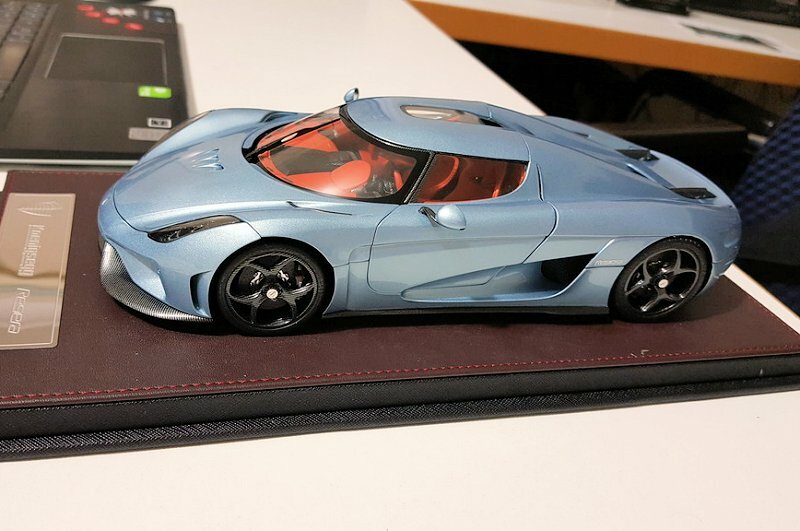 I don’t have a scale to weigh the model but if I had to compare it to another composite/plastic model then its about the same weight as AUTOart’s C7 Z06 Corvette. 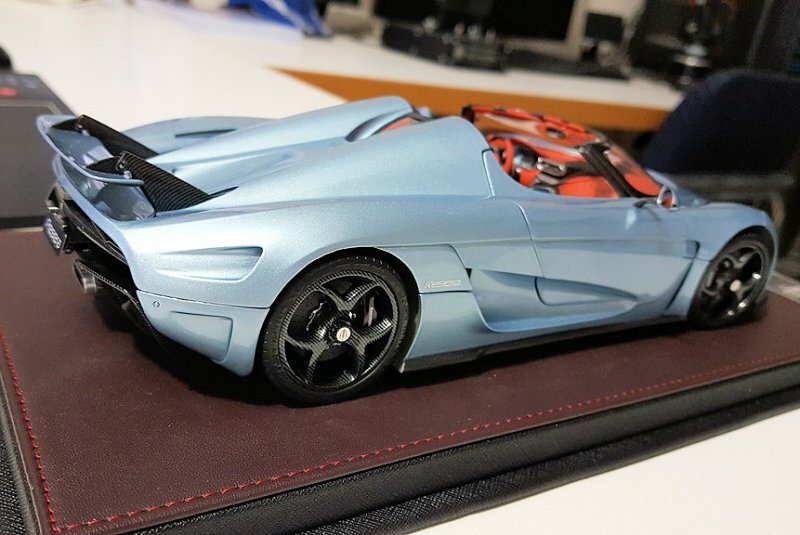 By no means is this even as heavy as some other even smaller die-cast cars around but the Fronti-Art model still feels weighty enough and looks and feels of very high quality. 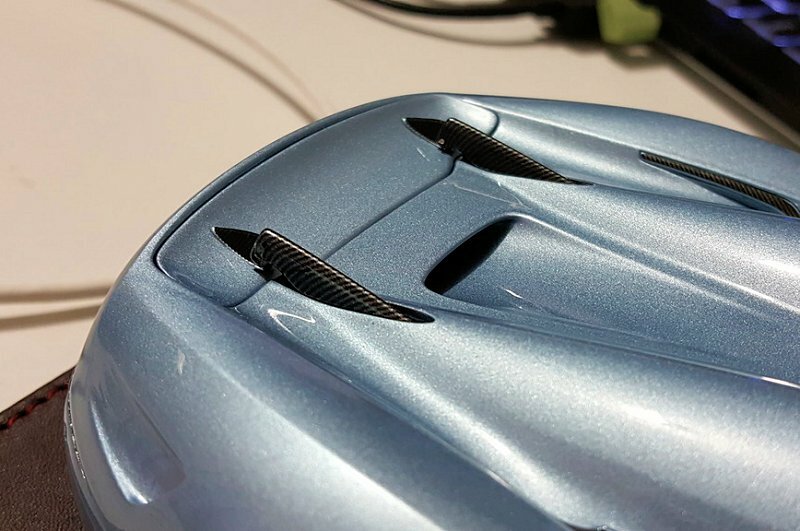 The flat underside of the model is rather underwhelming and typical of high end super/hyper cars of the current era. 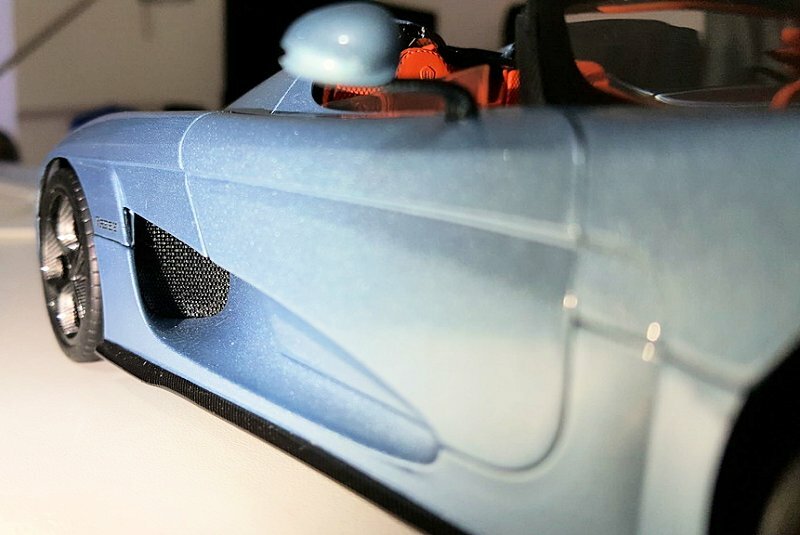 The carbon weave pattern has only been applied to the very front and rear sections of the under body leaving the exposed plastic of the center section of the model looking rather plain and boring. 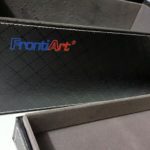 Though there is the Fronti-Art logo molded into the plastic at least. 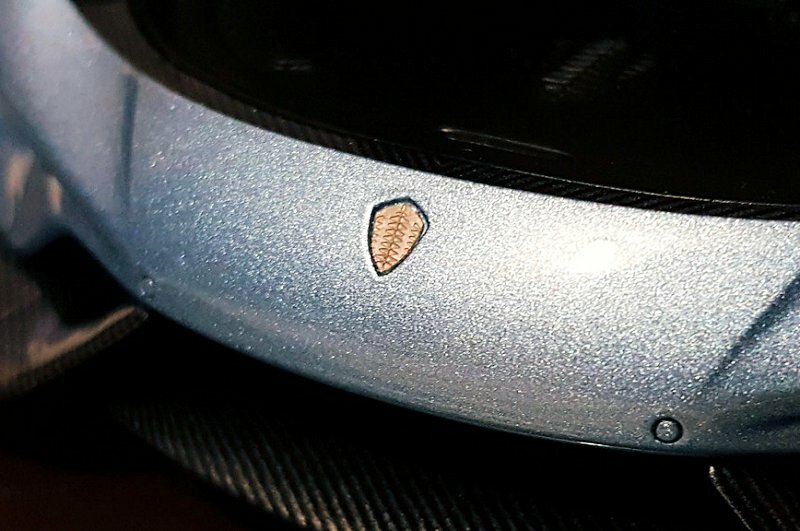 It would have been nice to have the entire underside covered in the carbon weave patter even if the brand logo wasn’t covered. This seems rather strange that they decided to skimp on this especially for a model of this price range.. 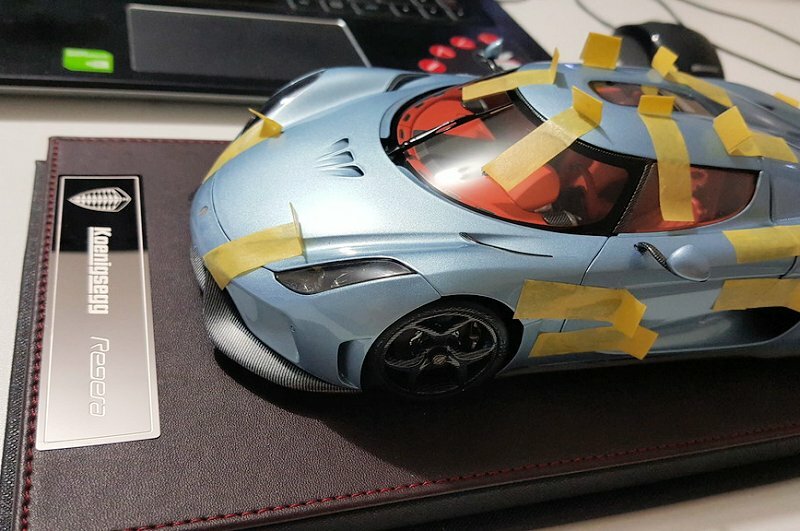 I guess they figured most people who bought this model would probably never remove it from its fancy base. 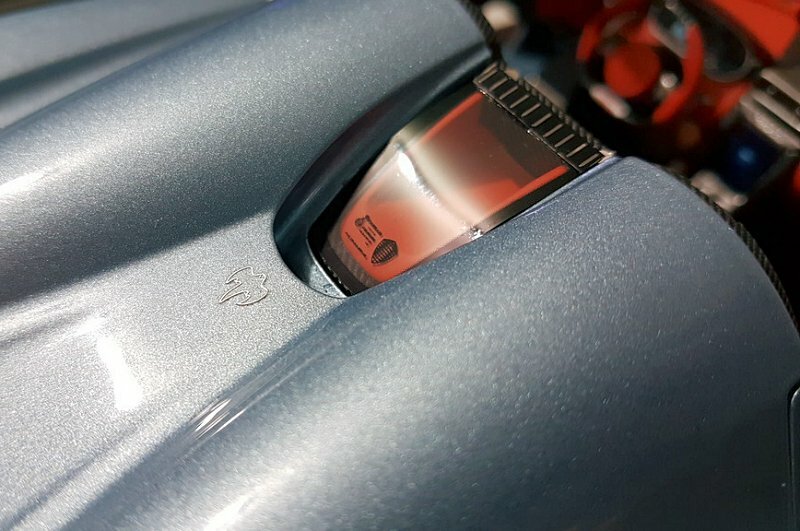 Also there is no serial number printed on the model anywhere nor is there a certificate of authenticity giving you any indication to which one of the limited 299 production run you have which is rather disappointing. Or at least that I’m aware of or how to tell? 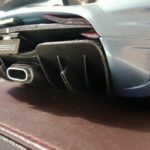 The rear diffuser area is all coated in carbon weave and included the specially designed Akrapovič exhaust tips as part of the diffuser vanes look accurate to the rear thing. Ride height does appear to sit a little too high at the front but its not bad at all and im sure could be easily corrected. 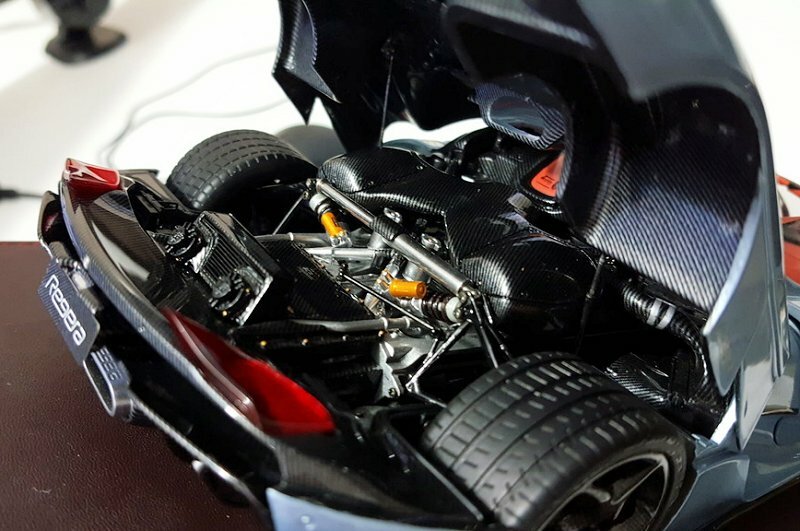 First thing I did was remove the roof panel, it pops off easily and there are several small magnets which keep the roof in place but aren’t quite strong enough to keep the roof on if the model is tipped upside down. 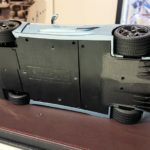 The underside of the roof panel is detailed to match the interior of the car and looks good. A feature I was not aware of before getting the model was the side windows can move to the open or closed position. 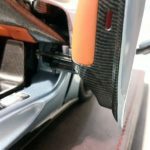 I found that this is an essential process in order to open the door to their fully open position as the side window would hit the sides of the front bodywork.. Whether or not this is the case for the real car I do not know. 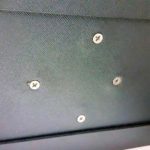 Or this could have been done to overcome a mechanical shortfall in the models door hinges which might not have been able or allowed to be replicated completely. This of course is all a guess..
Moving along to the interior which is a real highlight of this model! It is crafted so beautifully and there are some super fine details for you to lust your eyes over! 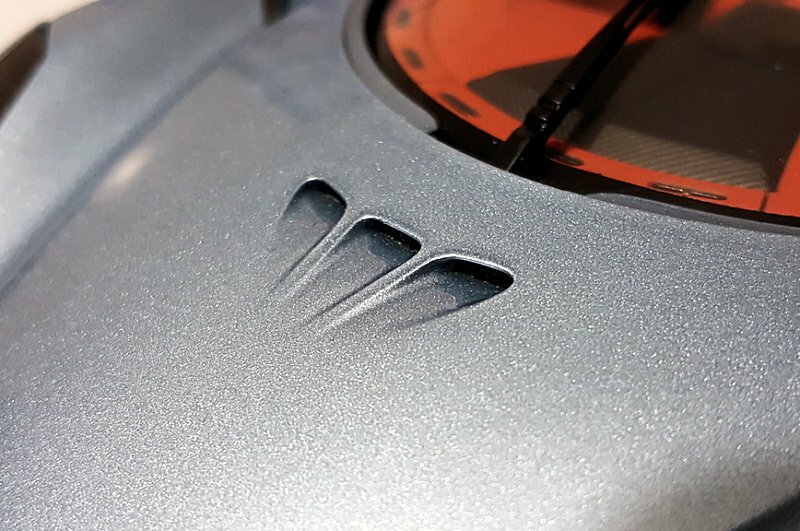 The instrument cluster is nicely detailed and very clearly legible. 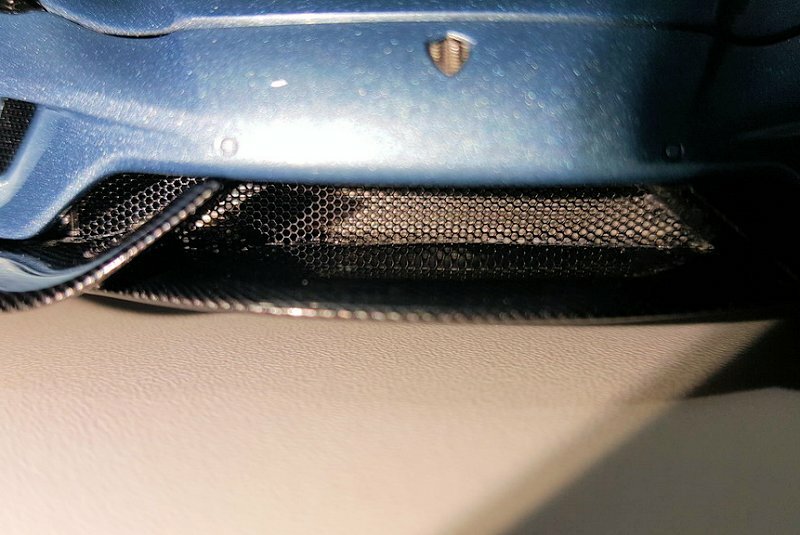 The cabin vents even have perforated grilles! 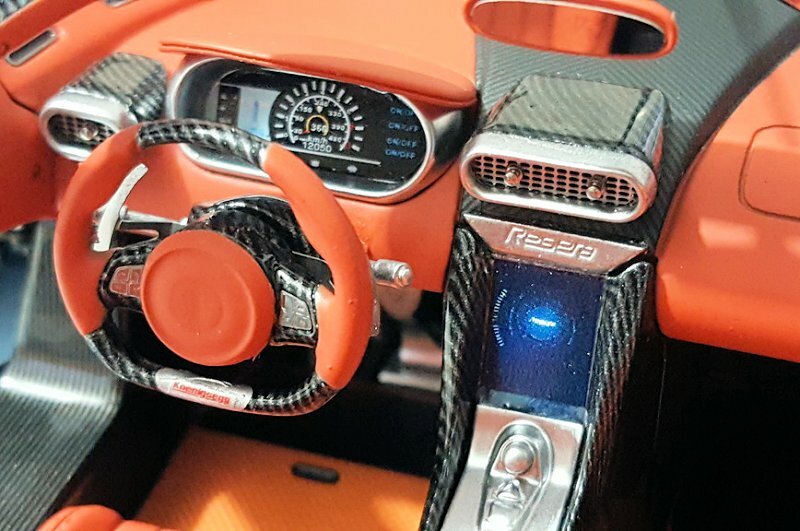 Super fine Koenigsegg and Regera lettering on the steering wheel and dashboard are also very clearly legible. 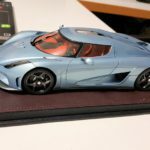 The driver and passenger seats are some of the very best I have ever seen on any model car of this scale! 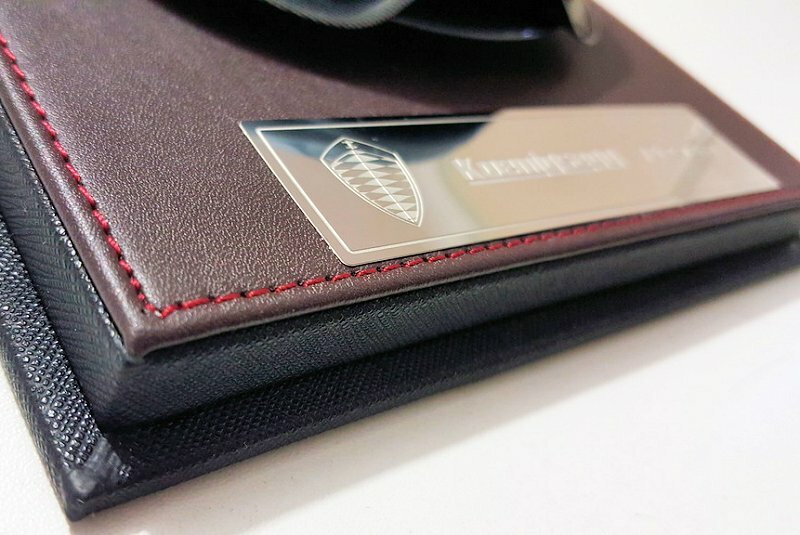 They look perfectly sculpted with nice surface textures and very defined stitching. 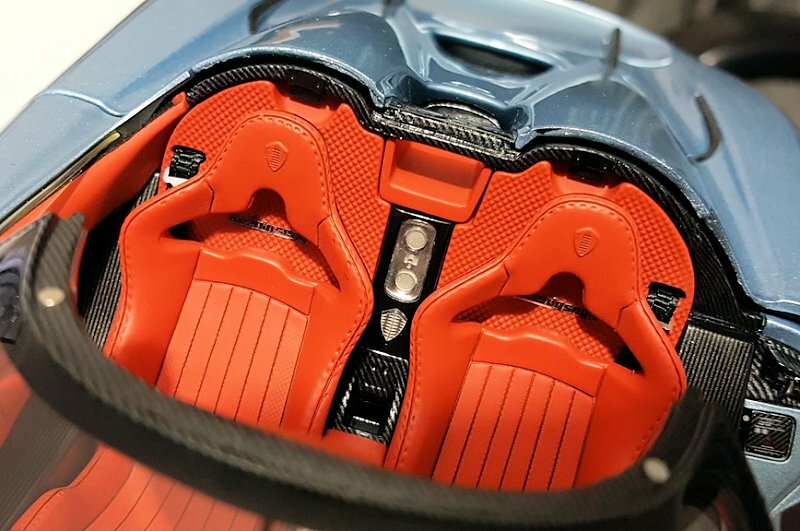 Each seat has their own Koenigsegg company emblem nicely crafted on the head rests. 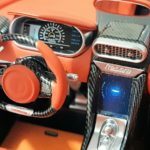 And there are a few more fine details between the seats and the center console. 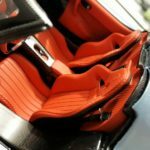 There are fabric seat belts with metal belt buckles which don’t look over sized, a problem suffered by many other models of this scale. 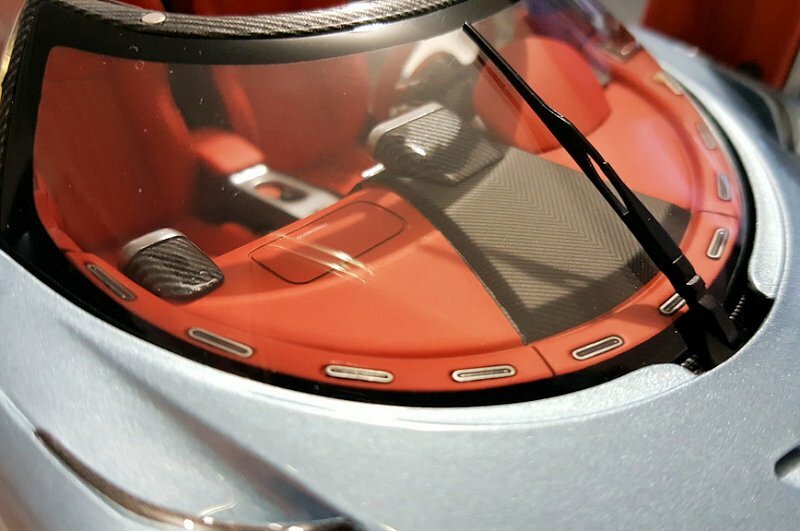 The forward upper section of the dashboard is one of the very few places with correct converging carbon weave pattern on the model. 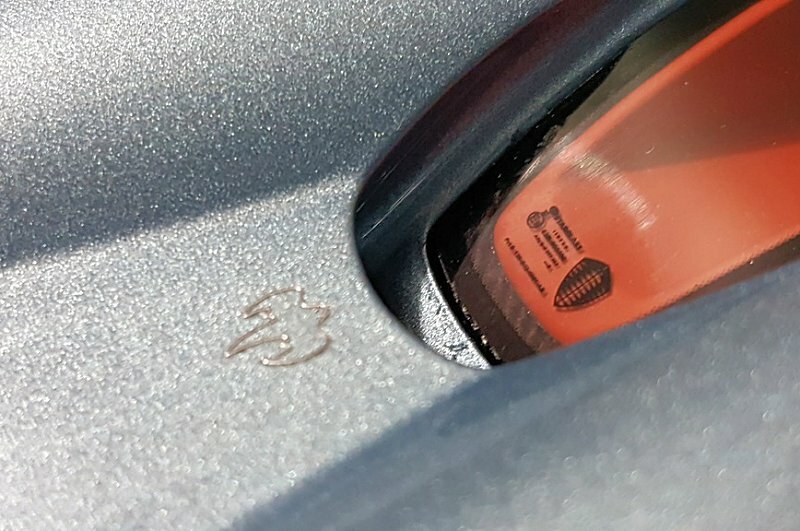 There are nicely detailed windscreen vents and passenger side air bag cover. 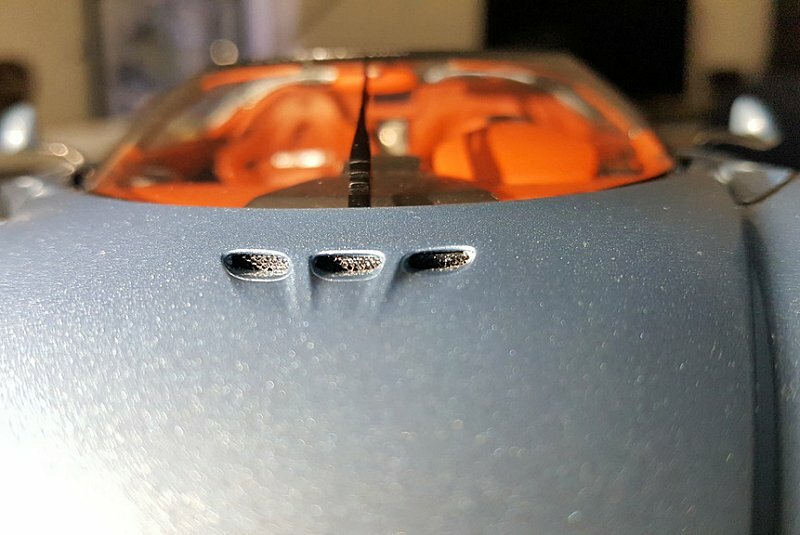 The windscreen wiper has been molded very well and is much nicer than many other model cars I own. 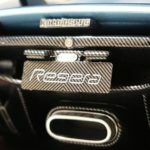 The carbon weave pattern on the door sills look amazing and there are beautifully detailed sill panels with “spirit of performance”, “Koenigsegg” and the company emblem all very easily legible. 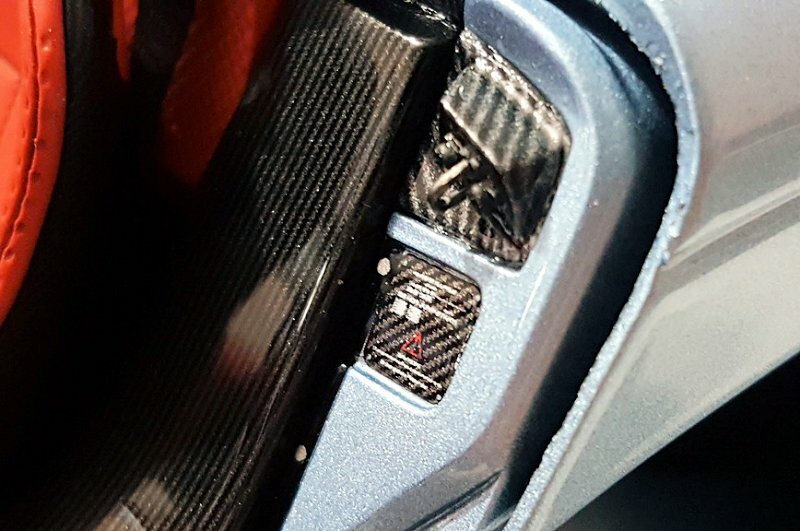 There are actual anchor points for each door and a carbon fiber warning panel with very fine lettering visible. 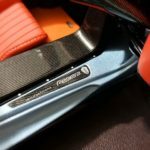 Fronti-Art have perfectly recreated Koenigsegg’s uniquely designed door hinge action which open and close just like the real thing! Not just a simple pull out and rotate action, these doors will rotate automatically as they are pushed outwards. 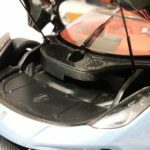 Even when you hold the model upside down and gently push the doors closed they will begin to automatically rotate to the closed position and sit very flush and tight with the rest of the body. 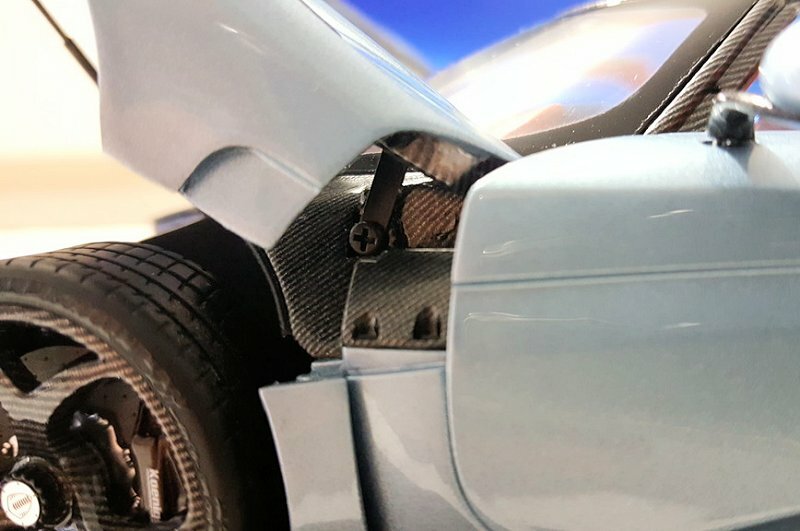 Definitely a very impressive feature of this model and to be perfectly honest it would have been a huge let down if they hadn’t included this unique hinge action. Whether or not the Helix mechanism is copied exactly to the real thing or that the feather weight of the doors on the model can get away with a system that closely replicates the action I do not know but the end result works perfectly and the action feels very natural. Though the passenger side door doesn’t quite open up completely compared to the drivers side door but I’m not prepared to force it open and potentially damage the model. Below is a video showing how the door action works. 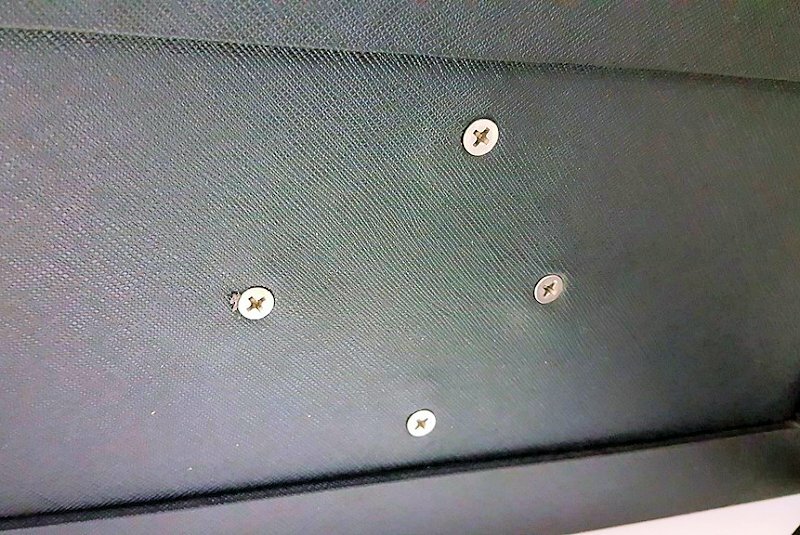 Each door has its own safety light molded on the underside and appears to be a separate piece. 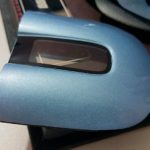 Side view mirrors look very accurate but care should be taken when handling the model as the mirrors do feel quite delicate. 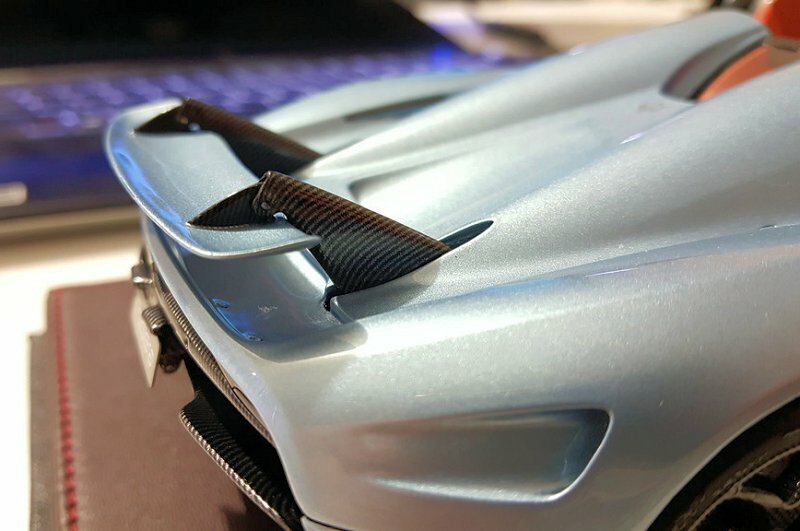 The functional rear wing has been recreated perfectly and extends and retracts just like the real thing! 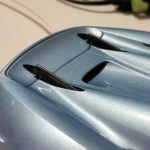 The wing can also be positioned to replicate different down force and aero braking requirements. 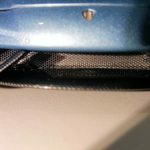 There is also carbon weave pattern applied to the underside of the wing to match the road car. 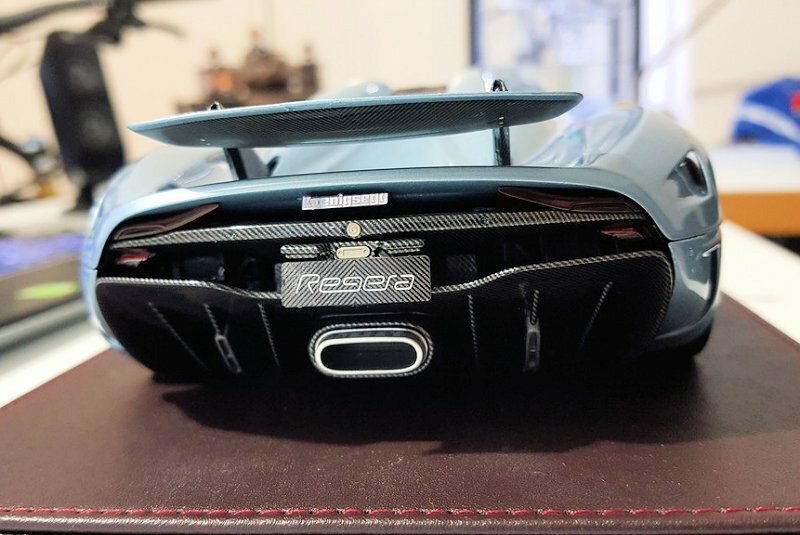 The rear Regera plate does fold down to reveal the charge port which I forgot to take a photo of but there isn’t really much to see anyways. 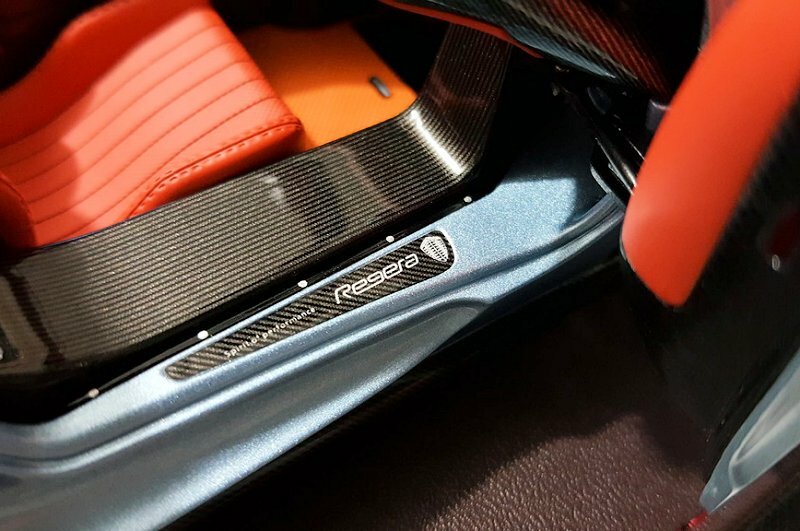 The Regera plate assembly is spring loaded and will spring back into the vertical position once you let of it. 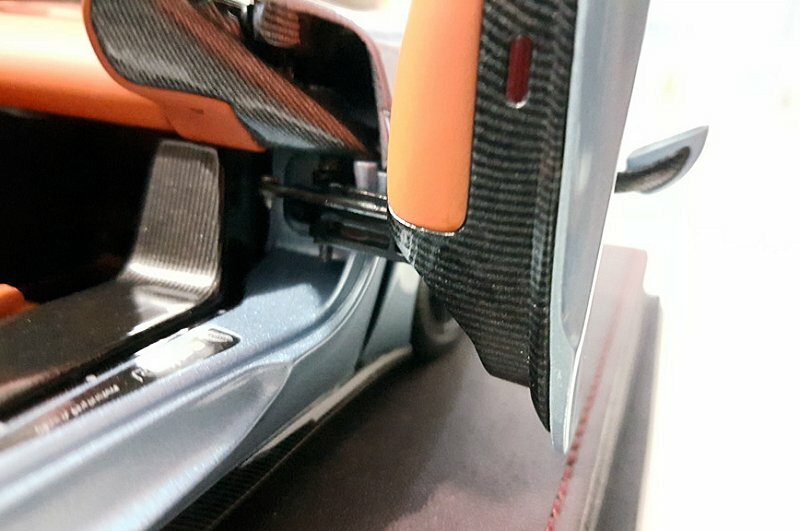 The Regera backing plate is also one of the few areas with the correct converging carbon weave pattern as shown here. 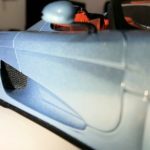 How much more amazing would this model have looked if they properly recreated this effect throughout the whole car! Such a shame. 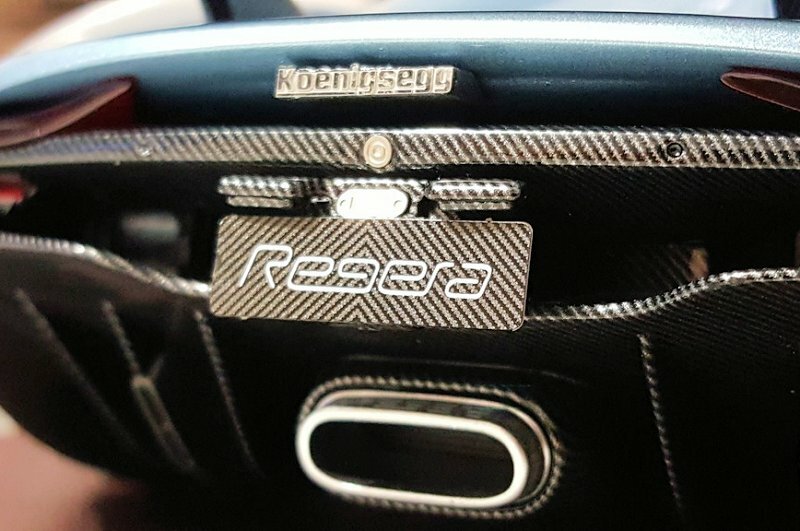 The Koenigsegg badge is just beautifully crafted and very defined! 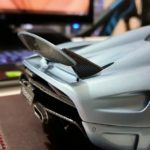 The tail lights are quite simple and slender in design but still look accurate to the real car. 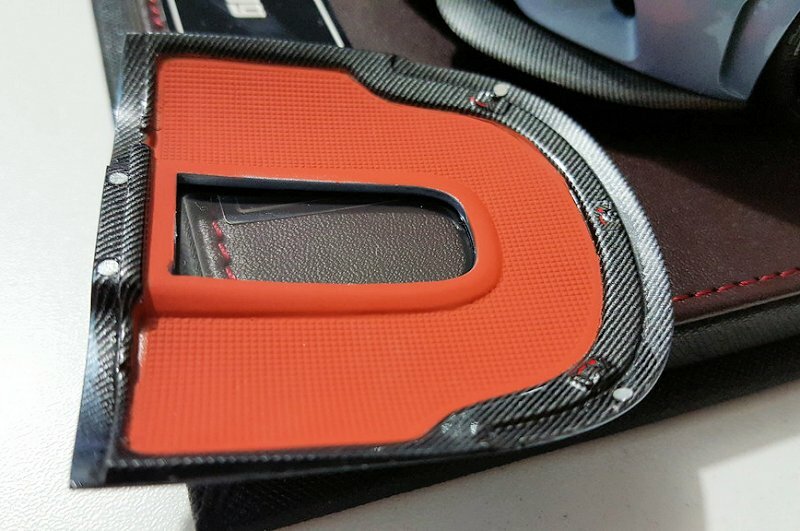 You can also see the reversing sensors molded into the thing carbon fiber panel. 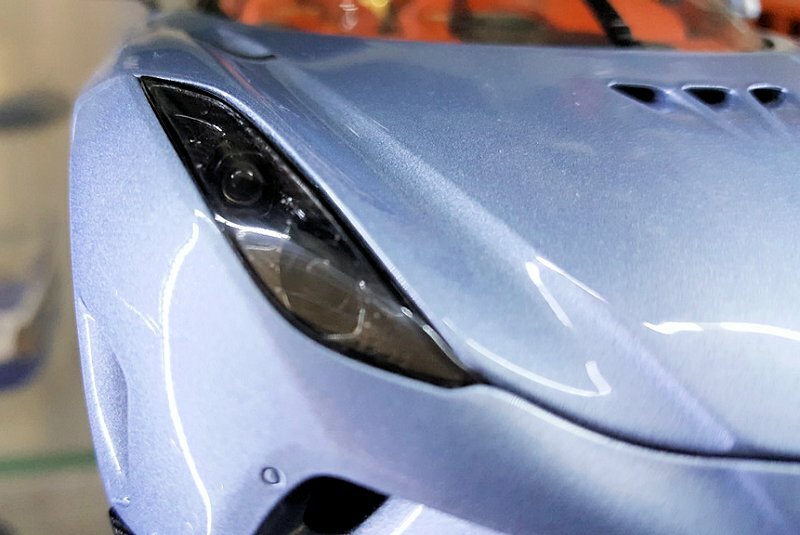 Head light details are done well. 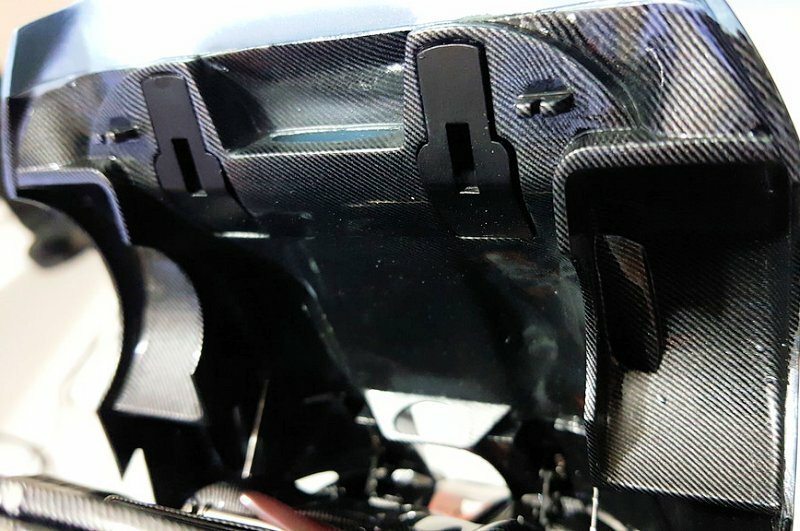 The bulbs are surround in carbon fiber molding and there isn’t really much to see but they are clearly defined. It was hard to get a decent photo showing as much of the detail as possible.. 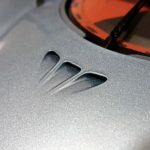 These small front hood vents do have perforated screens inside them which is a very nice detail touch! 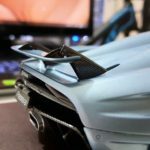 The Koenigsegg emblem on the front end is an actual separate piece and very nicely crafted! 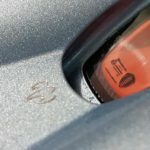 There are front parking sensors too! 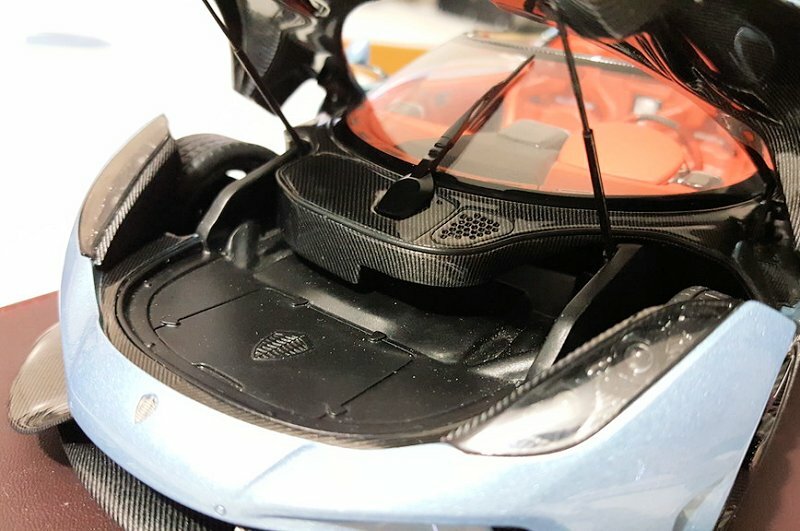 The front and side air intakes all have perforated mesh screens which is what you would expect on a model of this price point… the mesh appears to be plastic but is done well. 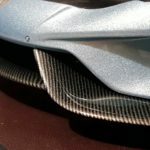 Under the front hood shows only some areas are covered in carbon weave which isn’t quite accurate to the real car but the whole area does look good nevertheless. 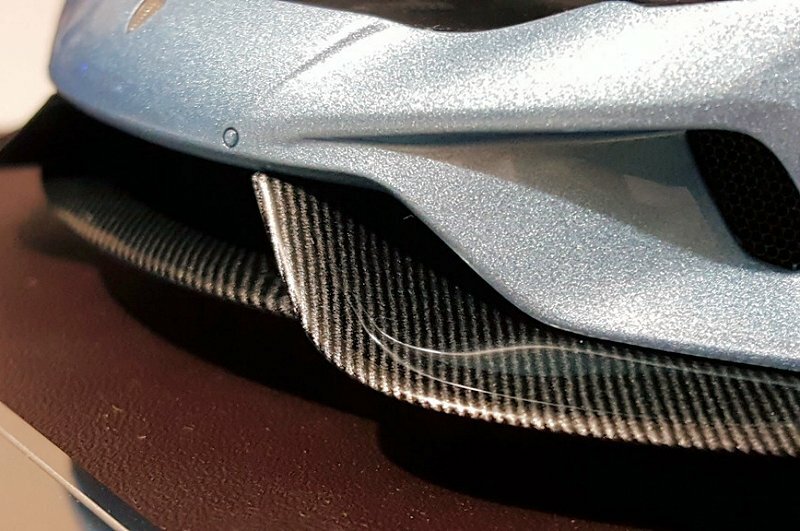 The underside of the front hood is mostly covered in carbon weave. There are a pair of functioning support struts. 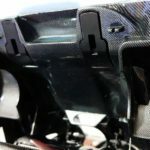 The carbon fiber area forward of the windscreen is very nicely molded and looks really great! The disappointing thing here is that there isn’t sufficient space to store the roof panel when not in use. A bit of a bummer but what can you do.. 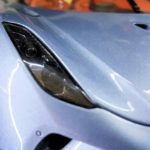 The front hood hinges are neatly tucked away mostly out of sight but are proper mechanical design and work very effectively. No ugly dog legs here! LOL! and you all know how much I hate those things. 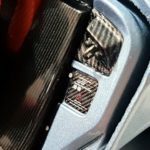 Another complaint of mine is the vortex generators just behind the cabin aren’t actually molded and appear to be a printed detail.. Considering the detail of some of the other molded parts, this is a bit of mystery as to why they didn’t actually mold these? Even if only printed, at least they are there I guess. 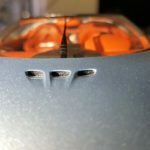 On the plus side there are some printed details on the rear view window and there is the little ghost squadron emblem on the engine cover! 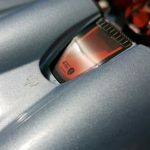 Engine bay detail is very nice! How nice you ask? 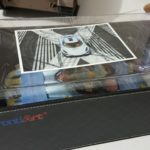 While having been done very well indeed I would say its about on par with some of the better AUTOart Signature series models. 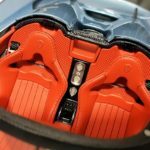 Is it as good or better than what I consider one of the best model car engine bays in the business being the AUTOart Pagani Zonda R? 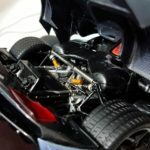 No it isn’t but its still very nicely done and has functioning suspension and the underside of the engine cover is covered in carbon weave pattern. And as with the front hood, there are functioning support struts and proper mechanical hinges. 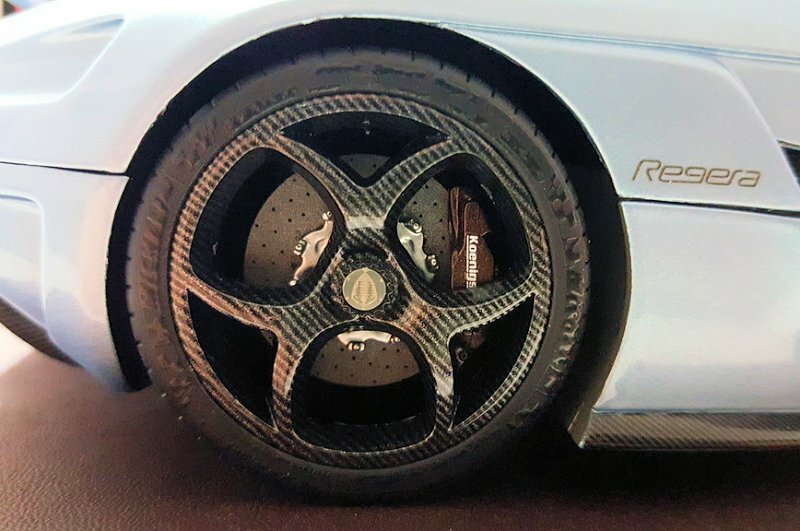 Wheel and tires are very well done and appear to be correctly proportioned. The tires do have the Michelin Supersport markings. 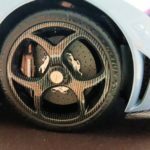 The carbon ceramic disc brakes look authentic with very finely drilled holes and match the actual two piece items on the real thing! 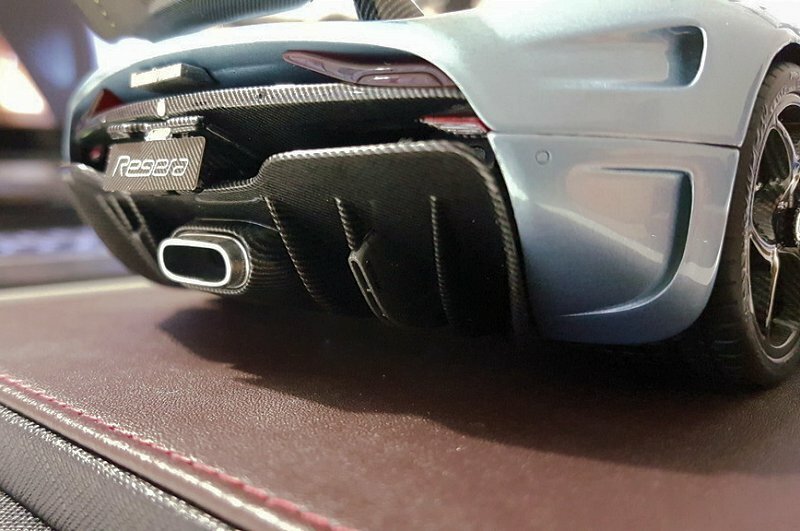 The brake calipers are very nicely molded and all have Koenigsegg lettering finely printed on each. 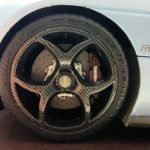 The carbon fiber rims with their “bio hazard” style pattern and carbon weave look fantastic! 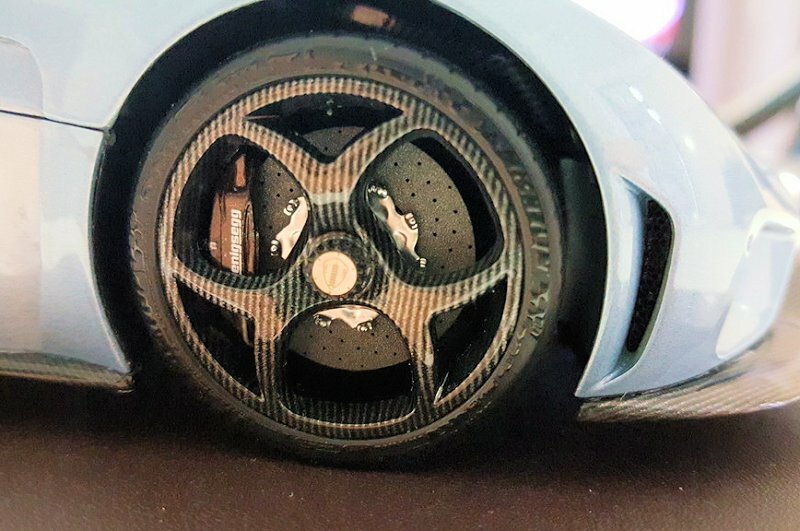 Each wheel has the Koenigsegg company emblem in the center cap and each wheel also has the air filler valve. 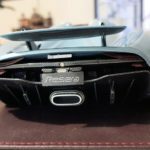 Also visible in the photo of the rear wheel is the “Regera” lettering on the side of the engine cover which is done very nicely! Another minor gripe is the small rear park brake calipers are missing. 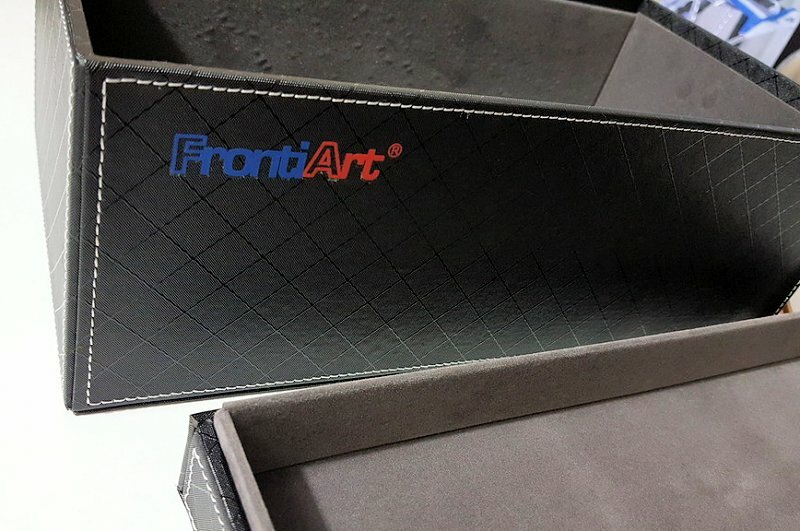 This does bug me a bit but I guess Fronti-Art must have decided it wasn’t worth the time, effort or expense to include it.. Again this is disappointing for a model of this caliber and price range. Well that’s it for the detailed photos and now for my final thoughts. Would I recommend this model to anyone else? For the average collector, a model at this price point then no I don’t. But not that its a bad model or anything as it isn’t! 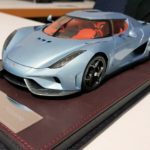 Its a fantastic model but I can only see the more serious collector being prepared to spend this much for it and accept the few detail shortfalls.. For me personally I wanted a model on the more elite end of the scale and this model was a must have and I was prepared to spend the premium on it. And I assure you I am more than glad I did as its a beautiful piece and a very worthy addition to my (or any) collection! Yeah there are a few low points but which model doesn’t have them? But on the flip side there are many more positive points than negative. Yeah it wasn’t cheap and I kinda got stiffed by customs for duties but at the end of the day its only money and more will always come around so spend away I say! I love the real thing and I love this model! 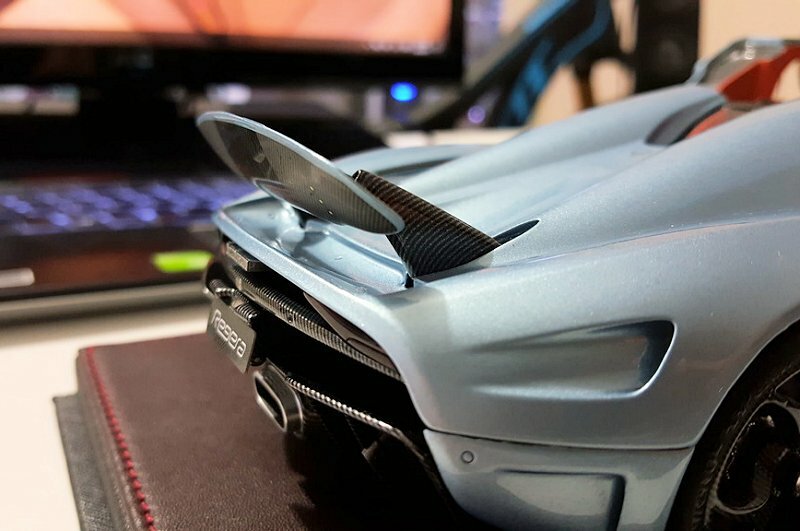 20 Responses to "REVIEW: Fronti-Art Koenigsegg Regera – Open version"
Wonderful review! That’s a hell of a model. 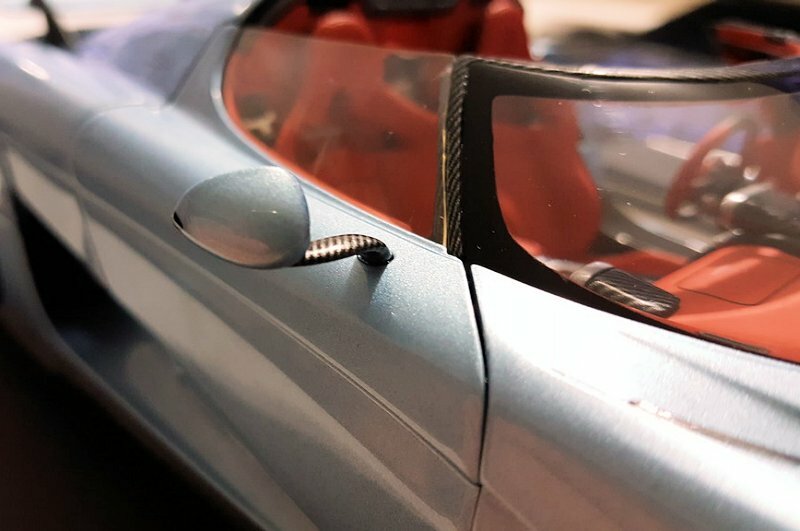 The door locking points are fantastic- such a small detail rarely seen on even the best models, but that shows the thought put into this one! 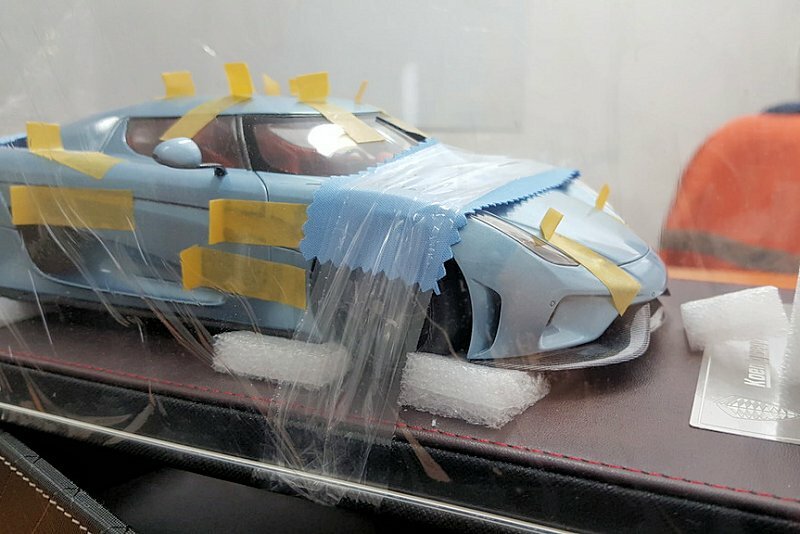 Is this a resin model? In the review the word composite is mentioned. That would be more logical, for an open model. Yes excellent review along with brilliant photos. well done indeed. 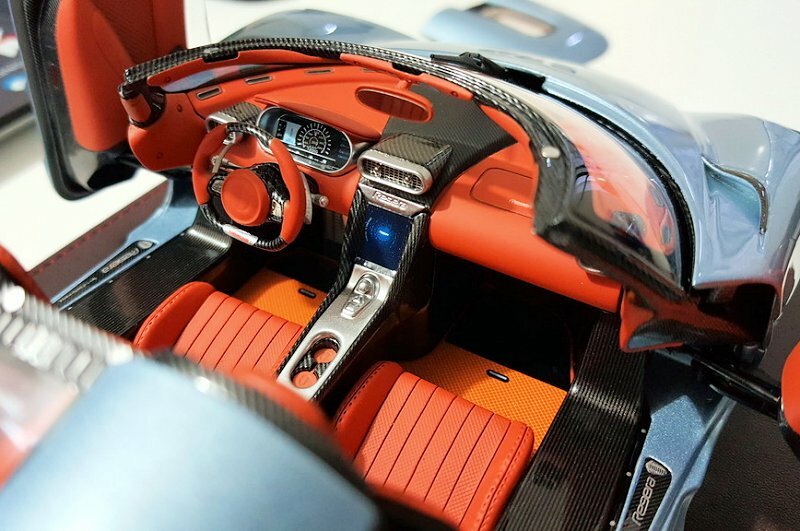 PS: Don’t forget the Autoart Pagani Huayra engine bay as well; a work of incredible detail. 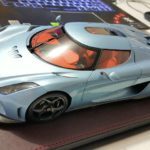 I have both (Zona and Huayra). 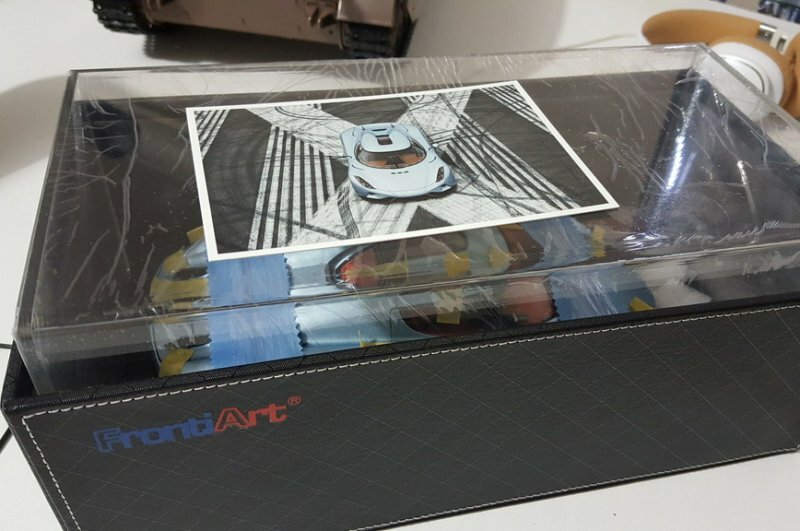 I also have one Fronti-Art Aston Martin One-77 (open version). 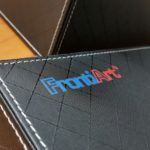 I am tempted, after reading your review to purchase a second Fronti-Art product. 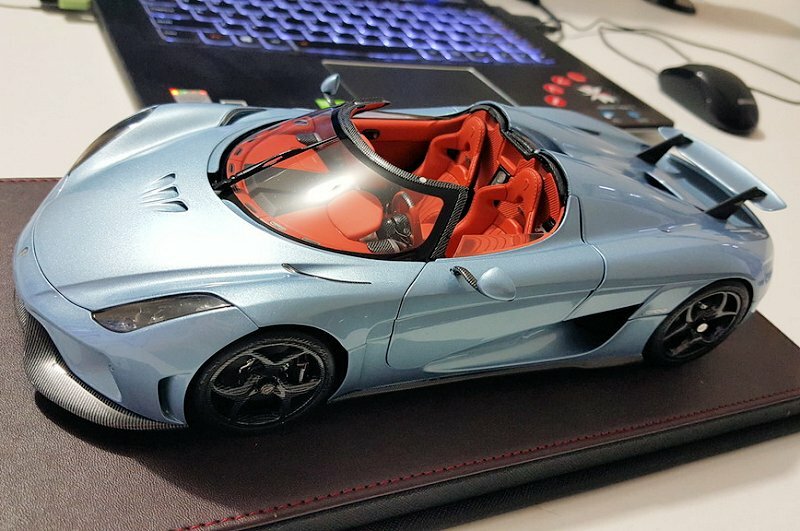 This Regera might just be the one. Again thanks for your excellent review. It was indeed very informative. Ohh wow…! cant say anything else.. 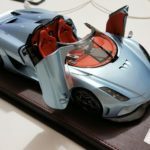 Fantastic review, at this price point it does but it in the ballpark of the likes of a BBR Enzo or Perhaps a Peako Zonda albeit sealed I must say the Ferrari does seem more appealing, stunning model nonetheless. Do the wheels roll and does the steering work? yes they do indeed! Stupidly enough those are details I completely forgot to mention.. The wheel do spin quite smoothly. 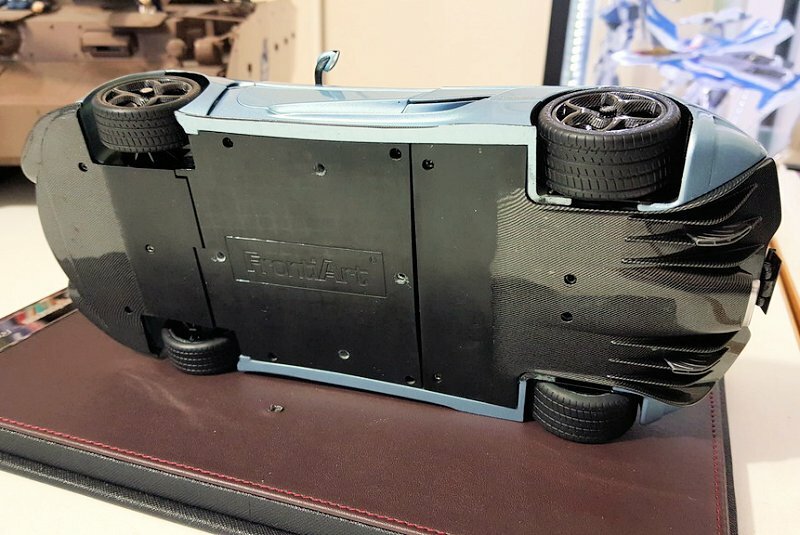 And even though the wheels will only steer about 30 degree in either direction, the steering has the highest degree of rotation that I have ever seen in a model car! 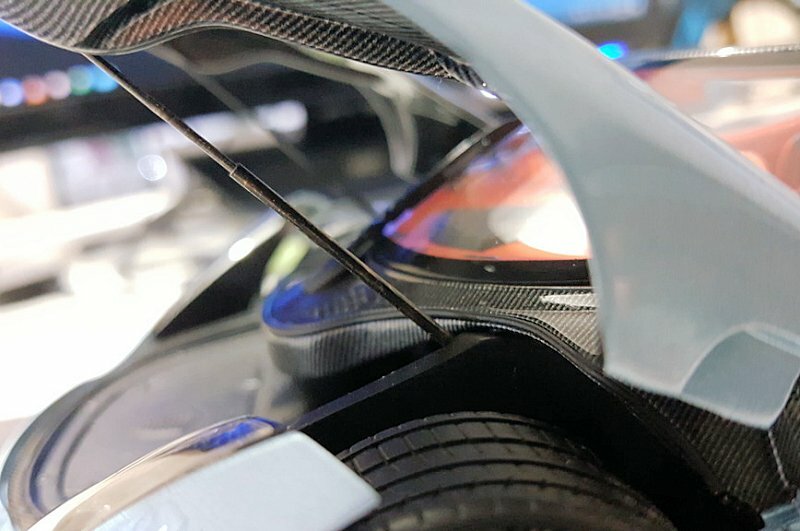 With the wheels fully steered the steering wheel has rotated about 130-140 degrees! 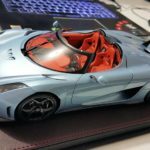 Amazing model and thanks for the refined review! Besides the front alignment, I see alignment on the rear wheel arch as well :( it’s still a nice model but for $700+, it should not have these many flaws…I am still considerinf it though. Just not sure if I should. Do those alignment issues look very obvious in person? 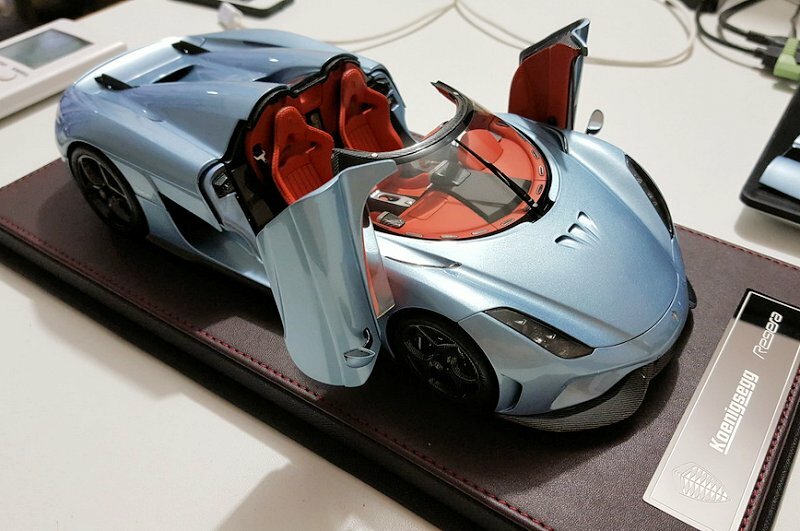 That’s an amazing model, I’ve been looking toward this. I had saved from putting the gas down on the MR Lamborghini egoista and instead waited for this. Now I see that this is better than that egoista! 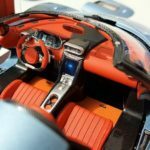 This model’s interior is one of the best interiors I have seen on a model! (Of course, Amalgam models are the exception) After this review I think I’ll give it a go! Great review Alex! 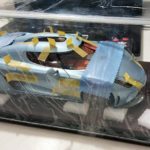 – is this model resin made or ABS (“composhite”) made? 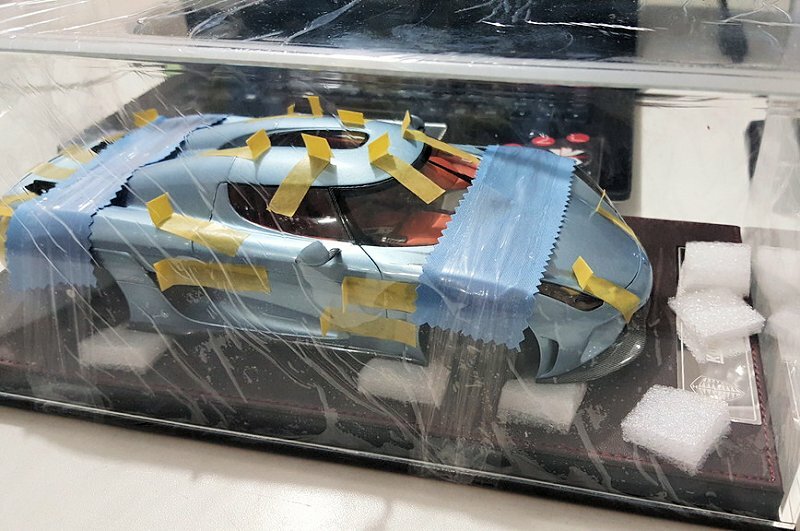 On eBay I could even read that this is metal diecast model… This is for sure not true, but I need to be very clear on whether it is plastic or resin. 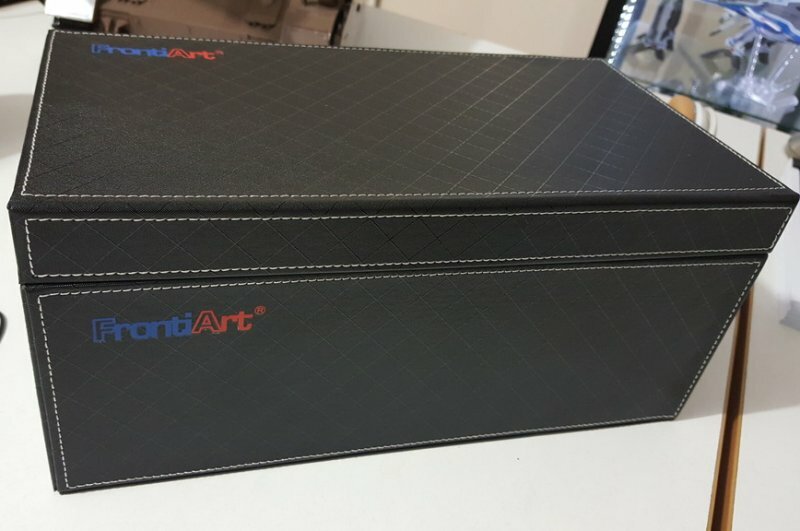 Does any statement about it comes printed on the box? 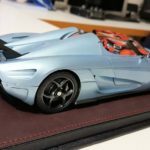 Are there any printed materials included with the model? Yes, poor website indeed! Their models are developed in a resin material be it sealed or open series. 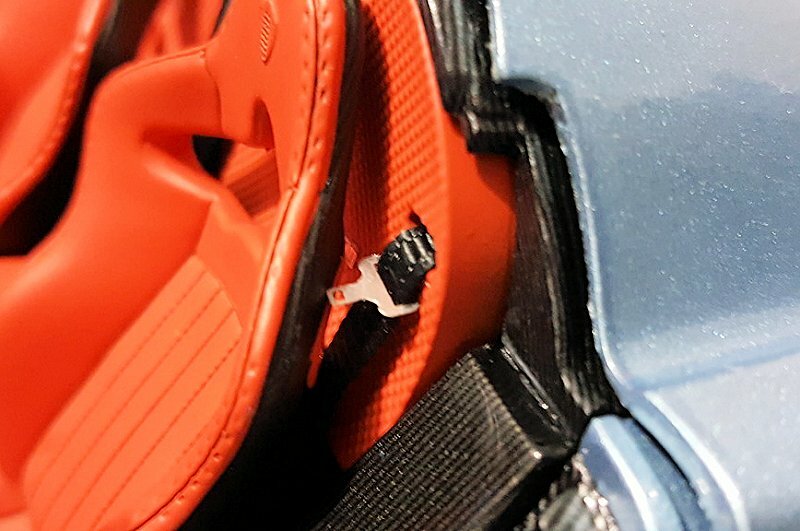 Isn’t this material too delicate (fragile) for moveable parts? I am really scared about it. 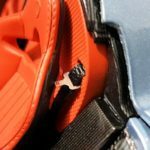 Does anyone have accidental experience with force required for breaking resin material? Isn’t resin more prone for deterioration from atmospheric influences (like humidity, warmth, oxidation or sunlight)? 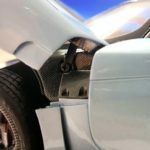 Many synthetic materials are prone to such problems.